The Act on Registration and Evaluation, etc. 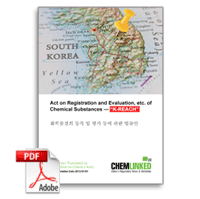 of Chemicals (a.k.a “K-REACH”) was passed on 30 Apr 2013 and came into force on 1 Jan 2015. It has been revised for several times and the revised K-REACH will come into force on 1 Jan 2019. The official translation is accessible here.